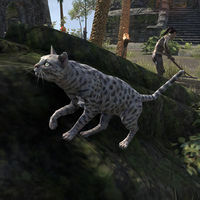 Haj Mota Hatchling pets are available from the Crown Store for 1000 . 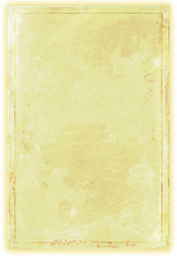 When targeted by a player, a health bar appear with a name: "Rojai". However, the Haj Mota Hatchling's actual default name is "Shelbert". 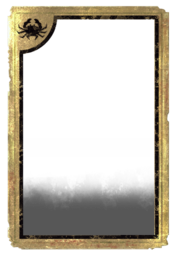 The Haunted House Cat was available as a Daily Reward during October 2018. Its default name is "Spectre Kitty". The Hearthfire Hatchling is a young half-blooded Hearthfire Kagouti that was available for a limited time in the Crown Store for 012001,200 . 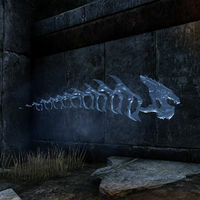 It returned on sale during the Morrowind Celebration Event in 2019. Its default name is "Scorchy". Native to the Cyrodilic Heartland, the Brindle Badger is said to be as fierce as a wolverine, yet as cunning as a fox. A Brindle Badger adorned the banners of King Hrol when he led his knights on the Quest of Sancre Tor. The Heartland Brindle Badger is available in Hollowjack Crown Crates as a Superior-level reward. Its default name is "Sir Snarls". 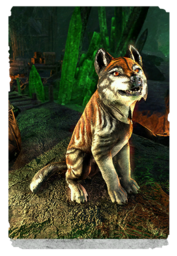 The pups of the Helkarn Wolves from Elsweyr are almost as sociable with people as dog puppies, so they get a lot of attention when young. This probably contributes to their docility as mounts when full grown. The Helkarn Wolf Pup is an upcoming pet that has yet to become available. Its default name is "Cuddlepaws". 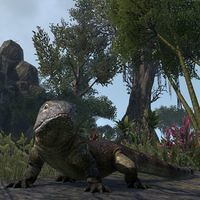 The Helstrom Ancestor Lizard is a lizard pet originally available from the Crown Store for 400 , and in the Storm Atronach Crown Crates as a Superior-level reward. Its default name is "Princess". It was originally datamined as "Pet Argozog" at release. The High Hrothgar Wraith is an ice wraith pet that was given as a loyalty reward for three months paid subscription. Its default name is "Tinsel". The Witches Festival, which celebrates horror and death, also has a regrettable tradition of wanton vandalism associated with it, especially among Tamriel's callow youth. The so-called "Hollowjack Netch" appears to be a victim of this practice. The Hollowjack Netch was available for a limited time with the Hollowjack Crates as a crown gem exclusive, and was priced at 300 crown gems. Its default name is "The Sticky One". When asked about the rumor that the Hot-Blooded Bantam Guar had been bred as a vampiric sub-species by the disgraced mage Darvasen before he was exiled from Shad Astula, Arch-Mage Valeyn replied, "What nonsense! They just like to eat tomatoes. Trust me." The Hot-Blooded Bantam Guar is an exclusive Bantam Guar pet granted for attending conventions in-person. Its default name is "Gory-Guar". 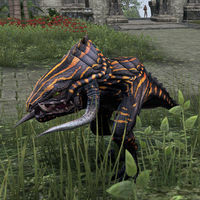 The Hot Pepper Bantam Guar Breed is native to the "spice island of Esroniet, the source of much of Tamriel's nutmeg, cloves, mace, and hot peppers. And the Pepper Guar has a spicy little personality to go with its name! The Hot Pepper Bantam Guar is an exclusive Bantam Guar pet granted for participating in the Elder Scrolls Online: Elsweyr announcement stream. Its default name is "Blisters". Housecats are gray tabby cats. 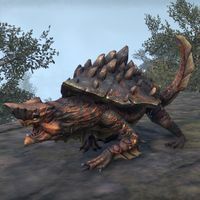 They are available from the Crown Store for 400 and in the Scalecaller Crown Crates as a Superior-level reward. Its default name is "Deathstare". This page was last modified on 2 April 2019, at 01:59.